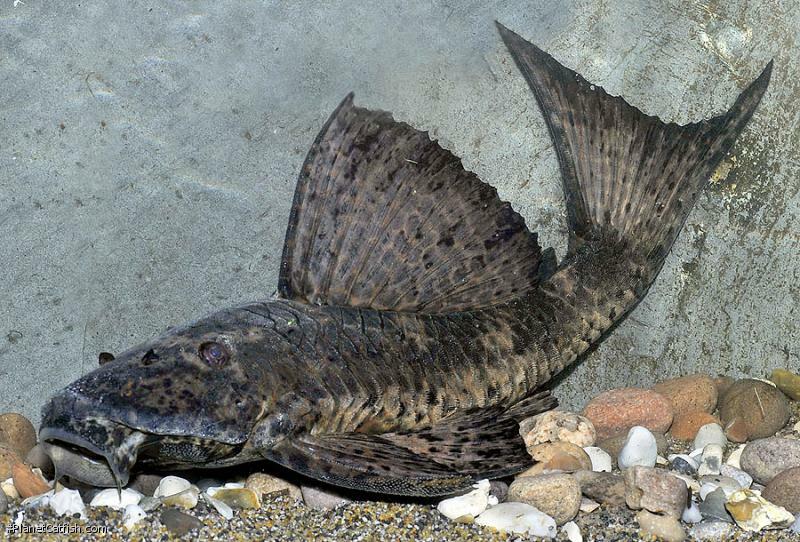 Hypostomus latifrons is a pleco that should be more popular, yet to most it's an obscure species that has not been personally encountered. It's a medium sized hardy fish that's easy to keep and not without intrigue. It has two l-numbers, an attractive patterning and is simple to feed. Relative to many other plecos, it's inexpensive. In fact, it's only negative point that I can find is its very scarce availability. In the wild this species can be found in the Río Paraguay basin part of the River Paraná system that spans the border areas of southern Brazil, Paraguay and northern Argentina. Typically it is collected in rivers north of the border city of Asunción. This part of the world doesn't have the same established tropical fish export infrastructure of Brazil, Peru or Colombia, but exports do happen if not with much regularity. At first glance this might look like another small brown pleco, but actually when young this species has the colour pattern of the magnificent Pterygoplichthys gibbiceps and displays brick red and brown colours in that well known pattern. As it grows, these spots turn to a very different rusty dark red on dark brown colour which is unusual. The adult fishes belly is heavily speckled against a rich golden colour. This change in appearance from juvenile to adult fish gave rise to the two l-numbers which were used when this species was initially imported. In a large tank, a small 2" or 5cm fish will reach adult size (just under a foot or 30cm) in about six or seven years given an average diet. While an efficient algae eater when young, this species is increasingly omnivorous with age and will eat prepared foods readily. Sinking flake based tablets are a good staple. It becomes increasingly reclusive with age, but will always appear when food is on the table. In the early months of operation of my current fishroom I mistakenly left a hose running cold water into a tank containing this fish. This flushed out all the water in the tank several times over before I discovered my error. I was very annoyed at myself as this temperature drop to cold water killed all the fishes in the tank except this Hypostomus. Clearly it will take, at least for short periods of time, much cooler water than is found in the average tropical tank. I would not hesitate recommending it for an unheated tank in a centrally heated house or sealed fishroom. As it gets larger, some plants may be uprooted by any large pleco in full swing, and this species when well fed is safe with plants. However, leave it for a couple of weeks and your prize Vallisneria may well have something of a major prune. Tank decorations can be wood, stone or a combination of both. In nature, this species lives in whitewater, with moderate current and at a depth up to around 6' or 2m. This is a fairly muddy environment and most vegetation is terrestrial shrubs and trees that dip into the river. The roots of these and fallen timber in deeper water are where this species is to be found as adults. A biotope tank would be low on rock and feature a root strewn area with suitable sized refuges. I often wonder why the common Pterygoplichthys is the species we all see in the chain stores and less enlightened LFS' missold as a cure for algae plagued tanks of all sizes. It's probably to do with how hardy and prolific the larger plecos are; yet there are others that surely must be just as financially viable and H. latifrons would appear to be one. Here's hoping, as imports of this cool species are an almost equal matter of faith. Type Locality Río Aguaray-guazú, Río Paraguay basin, River Paraná system, 24°22'50''S, 58°00'W, Paraguay. Etymology Greek, hypo = under + Greek, stoma = mouth. This specific epithet refers to its broad (latus=broad, wide) forehead (frons=forehead). Size 287mm or 11.3" SL. Find near, nearer or same sized spp.